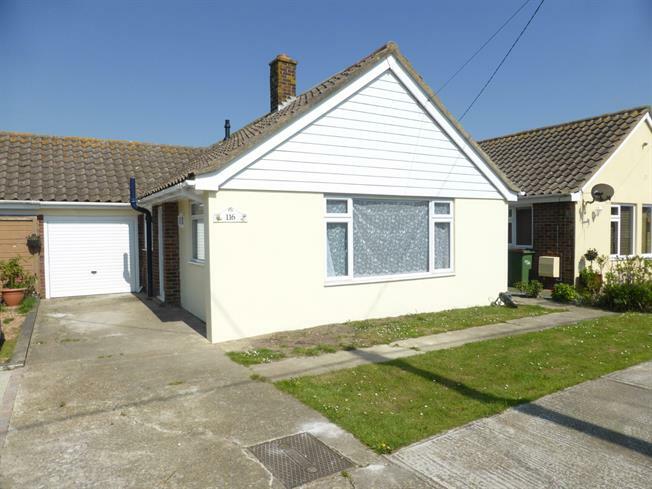 2 Bedroom Link Detached House Bungalow For Sale in New Romney for Offers in excess of £250,000. Refurbished two bedroom link detached bungalow with garage and off road parking for sale with no chain. The lounge is to the front and is a double aspect room. Modern kitchen with range of wall and base units, built in hob with extractor hood over, electric oven, space for fridge. Door leading to the side porch with tiled floor and doors to front and rear. Two double bedrooms and bathroom comprising panelled bath, wash hand basin, WC and tiled walls and floor. Off road parking for several cars leading to the garage has an up and over door and gives access to the conservatory. Lovely rear garden which is mainly laid to lawn and overlooks fields. This property has undergone much improvement and really should be viewed to fully appreciate.